XPRESSIONS - THE ULTIMATE IN FRAME & GRAPHIC TECHNOLOGY! 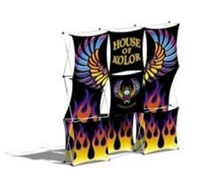 Create an amazing 3-dimensional exhibit display and increase your sales. Many frames and options for integrated graphics, and infinite configurations, offer you a playground to create dramatic effects with endless design possibilities. Xpressions the ultimate in frame & graphic technology. 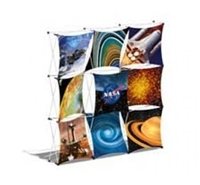 Create an amazing 3-dimensional exhibit display to increase your sales. Many frames and options for integrated graphics, and infinite configurations, offer you a playground to create dramatic effects with endless design possibilities. 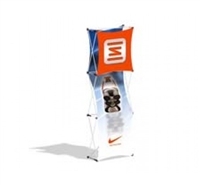 3-D capability and fabric size options create a truly unique trade show display and lasting impression. The frame is shipped with the fabric skins fully attached. 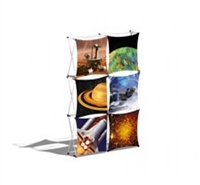 The portable, lightweight frame makes your display exhibit setup a snap. No tools or event labor required. Simply grasp with both hands evenly the right and left side of the center quad within the frame, then simply lift upward. Strong magnetic connectors lock the frame automatically within seconds. 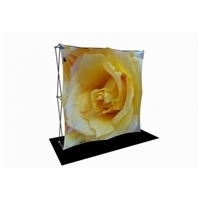 The versatility of this frame allows you to change graphics easily to create a fresh display. 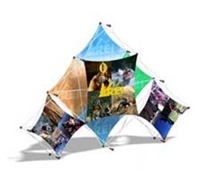 Xpressions Fabric Displays are truly unlike any display. Let your imagination run wild. Setting up a Xpressions display is easy!